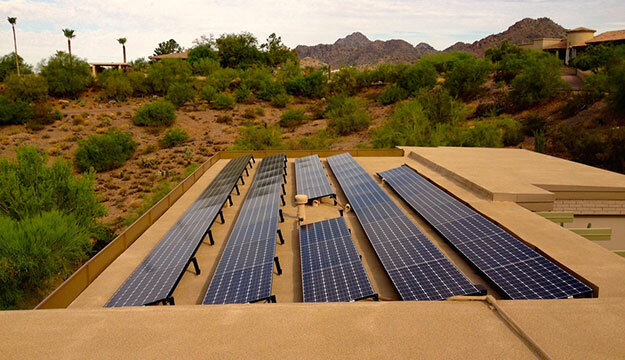 As the Arizona sun sizzles over the solar-covered roof of Paradise Valley homeowner John Holliman, Enphase Microinverters stay cool under the pressure. Knowing his system continues to perform optimally, Holliman can watch his energy bills melt away. In states like Arizona, where the relentless summer heat forces air-conditioning use to new levels, solar is a proven solution to help homeowners drastically cut high-energy consumption costs. Local installer Black Platinum Solar and Electric has capitalized on Arizona’s solar demand by providing their customers with reli- able PV technology that can handle the heat. “This is an environment where Enphase microinverters have contin- ued to prove themselves as durable and reliable technology,” added Black. John Holliman’s home received an energy upgrade when it added solar, but Holliman gained the best of the best when he requested Enphase M250 Microinverters. Greater energy production, more reliability and intelligent monitoring make Enphase the #1 inverter supplier in the U.S.
MyEnlighten, Enphase’s software-based monitoring, allows Holliman to track the health and production of his system as often as he likes. Holliman’s new Enphase System has covered his electricity bills by 100%, proving an investment in solar will create long-term benefits. The Enphase System revolutionizes solar power generation with industry-leading technology innovation. Enphase’s proven microinverter technology maximizes production of each module, which works together with advanced communications hardware and an intelligent software platform to deliver a reliable, high-performance solar array. Enphase technology doesn’t just survive in hot climates - it thrives.